back again…so soon, you say? 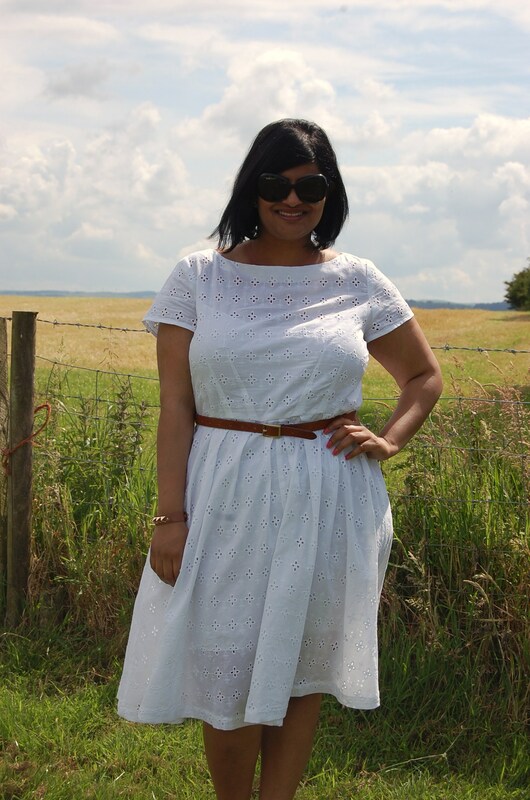 This dress was actually cut out and largely sewn up before my last blog post (the Vogue jersey maxi). I don’t often start another project before finishing one, but somehow I was craving a maxi, so this one was left to be hemmed. Also, having decided to make this dress unlined, I need to make a slip to wear under it. Let’s talk fabric first. This fabric is pretty special to me, because a) I love eyelet (especially white eyelet) and I find it very hard to find and b) I actually bought this fabric in Paris (as talked about here, last year). 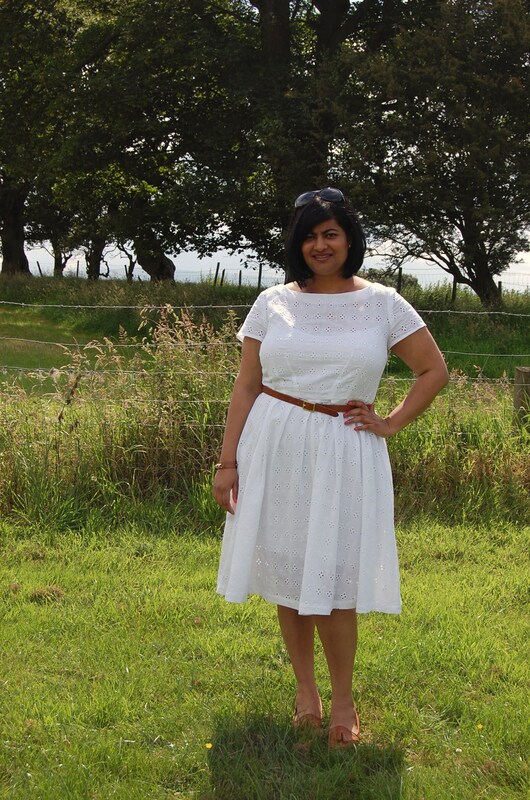 I was waiting for the right weather/ pattern etc, and finally settled on the hugely popular Simplicity 2444. As mentioned above, I decided to leave the dress unlined (a decision I really dithered over), but I love the flirty, airy feel of the fabric. BUT this meant I had to make a slip of some kind. That’s where McCalls 6696 comes in…not only does it have a great (still to be sewn) shirt dress pattern, but it has a slip pattern as well. Very handy. Overall, I love this dress and how I feel when I wear it. That’s not to say the fit is perfect. I think the front waist needs to come down a tad. But that won’t stop we wearing this dress. And the slip is the best fitting bias cut slip I own (all others being RTW). Inspired by Project Runway. Misses’ Dress sewing pattern with collar and sleeve variations. I think so, but I chose to do my own thing – see below. I love the final outcome. Nothing to dislike really. Cotton eyelet purchased last year in Paris. I added about 1.5 inches to the sleeves. I can’t stand tight sleeves at the best of times, so forget during hot weather. I omitted the pockets – this meant I didn’t follow the provided instructions, which have you sew the front bodice to the front skirt, and the back bodice to the back skirt before sewing the front to the back at the sides. Instead I constructed the bodice (sewing front to back and sewing side seams), constructed the skirt (sewing front and back together at side seams) and then sewing the bodice to the skirt. I used an invisible zip. I added 1.25 inches to the length of the skirt, but TBH it was not necessary. Next time around I would bring the front waist down a tad. Yes, I might sew this again. Yes, I recommend. I am very pleased I made time to sew this pattern – I can now see why it has been so popular. 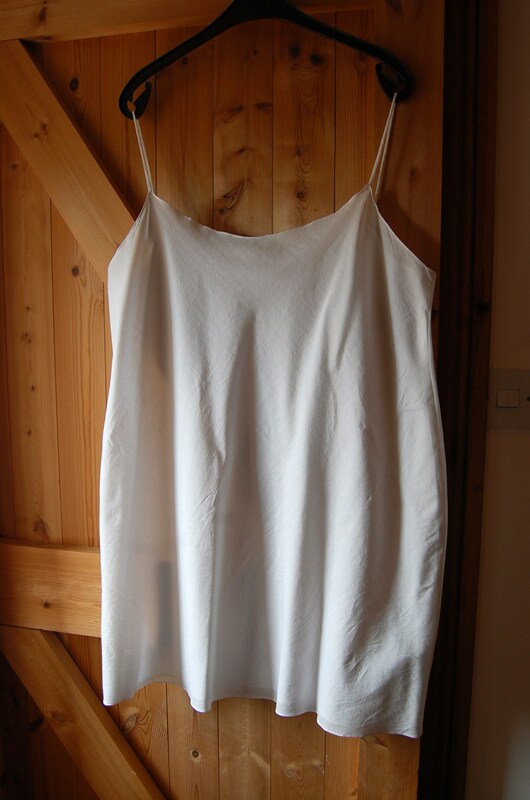 Bias, close-fitting slip has shoulder straps and very narrow hem. (Note: this pattern is for a shirt dress and includes a pattern for a slip. I sewed the slip only and so this review relates only to that). I think this is a great pattern to have on hand. The fact it is included as part of a shirt dress pattern is a bonus. Nothing to dislike. I would strongly advise sizing down, to account for the bias cut nature of this garment. I did a 1 inch sway back adjustment by pinching out the required amount, tapering to nothing at the side seams. Shortened slip length by 2 inches before cutting out. I used a Schmetz 70 needle for fine fabrics. I used French seams to sew the side seams. I might sew this again as required. It is a great pattern to have on hand: I highly recommend. Be warned there is some very delicate sewing on this project: rolled hems at the armholes/ necklines and the hem, and I made my straps with my rouleau turner. But I am very pleased with the finished garment. Until soon, and have a great week! Wow, you look fabulous, I think this is one of your best makes that you’ve shown! And love your slip – so simple but so elegant!! Beautiful dress and “light and airy” is a great description. I also has a ladylike playful feel as well. I think I have several pieces of eyelet in my stash and might has to copy your example. Or maybe I can just borrow yours! Thanks rachelle. Do it. You won’t regret eyelet for summer. I love this! I need a Little White Dress and love seeing them. Your version is perfect in every way! This is really pretty Manju. You’re right about eyelet fabric being hard to find, however White Leaf Fabrics have some lovely eyelet in white and black at the moment. I love your photo location too. I love eyelet too, although I don’t anything made from it. Your dress turned out lovely. 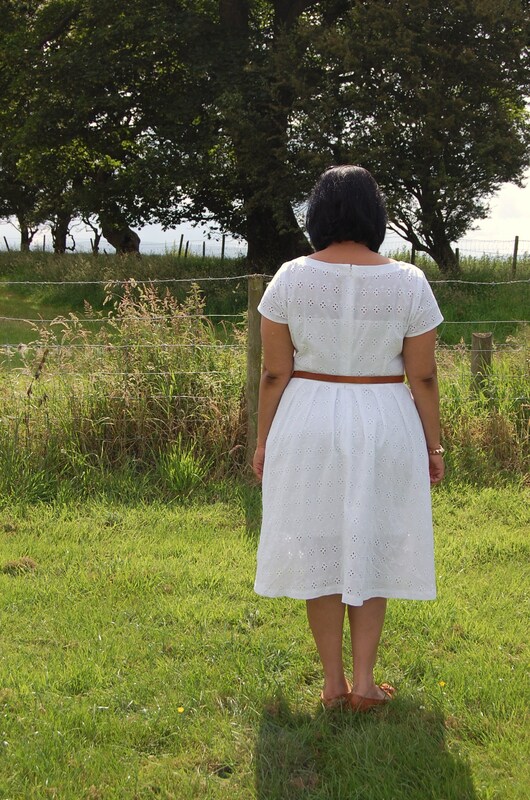 Oooh, I love this in eyelet, once more you inspire me lady! Beautiful dress…you look great in it! So crisp and pretty on you. 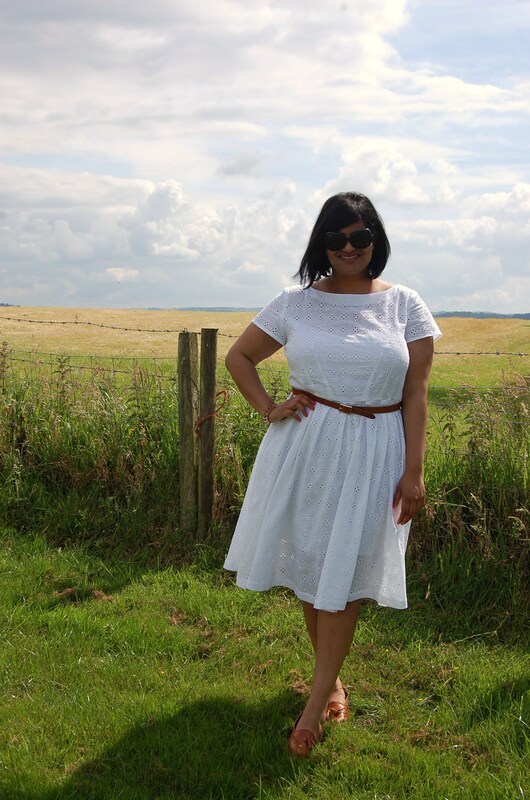 It’s the perfect summer dress! 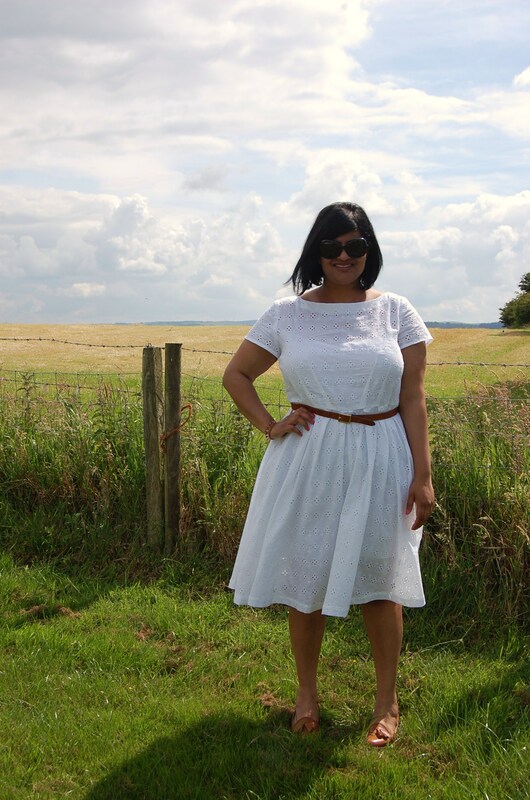 Beautiful summery dress. The white eyelet looks so fresh. Nice slip too. Very pretty! Great for the hot weather too! Love the fit on your dress; the back looks perfectly fit to you, and makes your waist look tiny! The eyelet is beautiful, I’m so glad to see a review of the the slip pattern as well, as I was wondering how it would fit someone with measurements like mine. Thanks for the inspiration!